Tyne & Wear Archives is delighted to present a new flickr set remembering Sunderland ship launches of the past 150 years. The set has been produced to celebrate Sunderland History Fair, which will be held at the Seaburn Centre, Sunderland on 7 June. I’ll be attending the Fair and will have some original shipbuilding archives with me. The images cover a wide period with the earliest image showing the barque ‘Vencedora’ ready for launch by Robert Thompson’s shipyard at North Sands in 1860, while the final image shows the roll-on / roll-off ferry ‘Superflex Bravo’. 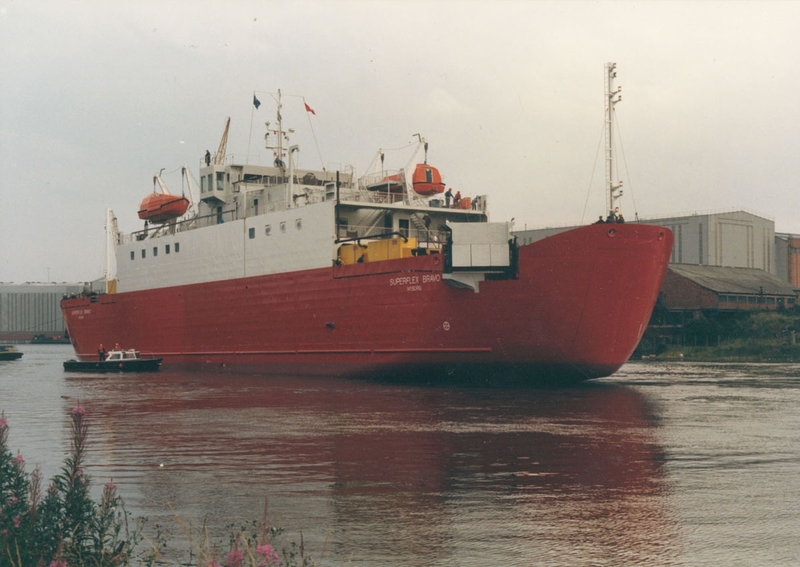 She was launched by North East Shipbuilders during the final years of shipbuilding on the River Wear. The set reflects some of Sunderland’s great shipbuilding achievements, such as the development of turret ships by William Doxford & Sons Ltd in the 1890s and the design of the SD14 by Austin & Pickersgill Ltd in the 1960s. There are also images documenting Sunderland’s contribution to the Royal Navy during the First World War. William Doxford & Sons Ltd built and engined 21 torpedo boat destroyers for the Admiralty between 1914 and 1918 and the flickr set includes four photographs of HMS ‘Opal’, launched by the firm on 11 September 1915. View of the First World War torpedo boat destoyer HMS Opal, launched by William Doxford & Sons Ltd, September 1915 (TWAM ref. DS.DOX/6/8). During the First World War HMS ‘Opal’ was based at Scapa Flow and in 1916 she took part in the Battle of Jutland, the largest naval battle of the War. Tragically, ‘Opal’ was wrecked on 12 January 1918 along with HMS ‘Narborough’ after both ran aground during a terrible storm off the Orkney Islands. Only one man (William Sissons) survived, while 188 others lost their lives. The set also includes images of two ‘half ships’ built on the Wear. There’s the ‘Rondefjell’, known locally as the ‘Half Crown Ship’, because she was built by John Crown & Sons Ltd and launched in two halves in 1951. 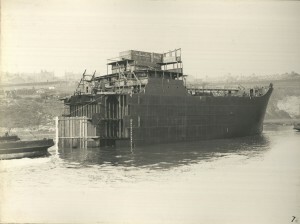 By building in this way the firm was able to build longer vessels than would otherwise have been possible at their yard. 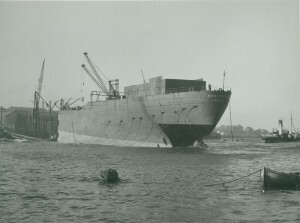 The aft and fore sections were towed to Middle Docks at South Shields where they were joined in October 1951. The other ‘half ship’ is the new fore-part of the ‘Vardefjell’, launched by Sir James Laing & Sons Ltd, 27 March 1944. ‘Vardefjell’ belonged to the Norwegian Merchant Fleet during the Second World War but on 13 December 1942 tragedy struck while she was serving as part of an Atlantic convoy. Two days after leaving the Clyde the ‘Vardefjell’ broke in two during a heavy storm and the forepart drifted off with the loss of all those on watch there. Fortunately the 29 crew members on the aft part survived and eleven days later on Christmas Eve they were rescued by fisherman off the Faroe Islands. The relief that those men felt must have been tinged with the sadness of remembering those who could not be saved. The remains of the vessel were towed to Kirkwall and were later joined on the River Tyne to the new fore-part built by Laings. A more detailed account of those events can be found on the Warsailors.com website. These are just some of the many fascinating stories to be found in our Sunderland shipbuilding collections. To find out more why not visit the Archives? You can find details of our location and opening times on our website. Alternatively, you can catch me at the Sunderland History Fair on 7 June where I’ll be delighted to chat and answer any questions. Concerning ships” is an historical survey of the progress of the Firm of “Laing” from the age of wooden walls to the development of modern shipping. In placing on record our history we are conscious of our glorious heritage and are to-day developing new ideas upon the tried plans of the past. the name “Laing” stands for all that is best and we are determined to keep pace with the acme of perfection. Certainly a heritage I am very proud of and I hope to be able to visit the area (I live in East Sussex) to find out more in the future. Thanks for getting touch. Laings certainly was a very fine shipyard, with a great heritage. The firm launched some of Sunderland’s best known ships, including the famous ‘Torrens’. If you haven’t already seen it, I did a short blog about the Laings collection when I was cataloguing it http://www.twmuseums.org.uk/engage/blog/recent-developments-on-the-%E2%80%98we-mak%E2%80%99em%E2%80%99-sunderland-shipbuilding-archives-project/. I hope you get a chance to visit the North East and if you do you’ll certainly get a warm welcome in the Archives. We’ve got plenty of Laings records for you to look through. You can find details of our location and opening times on our website http://www.twmuseums.org.uk/tyne-and-wear-archives/visiting-us.html. I wonder if you can help. I am looking for a picture which I remember seeing many years ago. It was of a ship being launched (laings I think) and the photo was from the rear looking at the moment of launch. The drag chains were clearly being pulled as the dust showed they were under tension. The photographer captured the explosive energy fantastically. This stuck in my mind and I have always wanted to try and track down the picture. I worked (as did my father) at laings when I left school in 1977 but have lived in New Zealand for 9 years. I am visiting UK and Sunderland in September this year so would very much appreciate any direction you may be able to offer. If you haven’t seen all the Sunderland ship launch images on our Flickr pages then it might be worth taking a look. 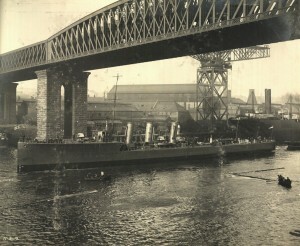 The Sunderland Launches set includes a few that were taken at the Deptford Yard https://www.flickr.com/photos/twm_news/sets/72157644063652967. If you can’t find what you’re looking for there then it would be a good idea to visit the Archives searchroom at the Discovery Museum. You could browse through our Sunderland shipbuilding photographs and with a bit of luck you might find the photograph mentioned in your message. You can find details of our opening times on our website http://www.twmuseums.org.uk/tyne-and-wear-archives/visiting-us.html. I am currently writing my Thesis which is looking at how WWII affected the ship building community of Sunderland. Does anyone know the total number of ships made during the years of 1914-1918, and then 1939-1945. If not, does anyone know the best place to find them. The best thing would be for you to visit our Archives searchroom. 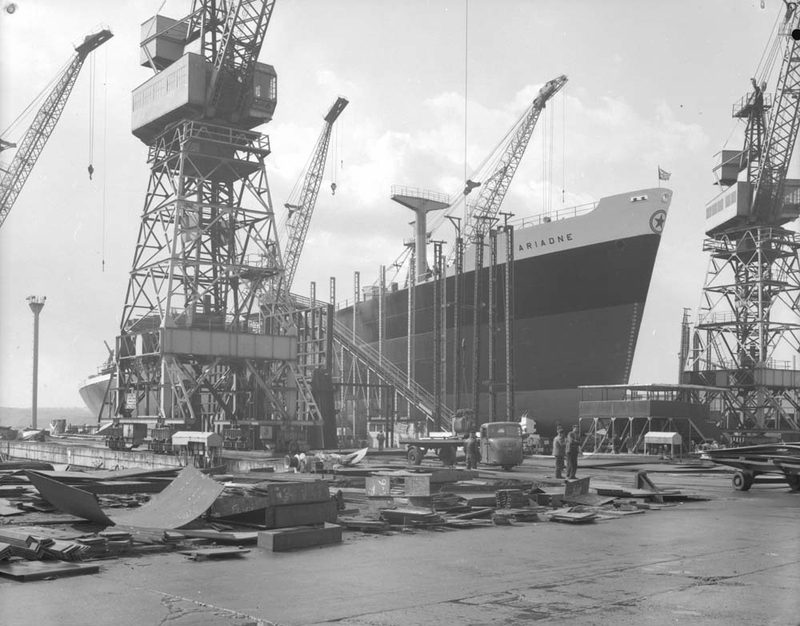 Our searchroom library includes a volume listing the River Wear Shipyards output (ship by ship) covering the years 1867-1981, which should help you. There may well also be useful information in Joe Clarke’s book ‘Building Ships on the North East Coast volume 2 1914-1980’ (published by Bewick Press, 1997), which is also available in our searchroom. Details of opening hours and how to find us can be found here https://twarchives.org.uk/visit-us. I hope this helps.